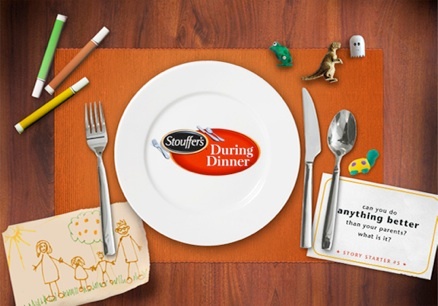 Stouffer’s Lasagna was looking to not only increase sales, but to be the meal that helps bring families together – to share the dinnertime experience and generate social currency and positive talk value. ‘During Dinner’ is an entertainment-based program designed as a microsite that featured a relatable comedienne host, played by sitcom actress Jenica Bergere, along with a suite of content to engage both mom and her kids: funny videos, animated shorts, and downloadable games. 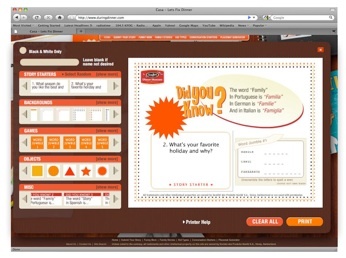 The storyline followed a typical American mom on her quest to get the whole family to the dinner table, and was supported by both a digital media campaign and by traditional print and TV advertising. 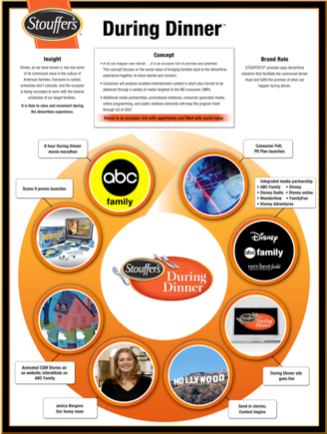 A contest in partnership with ABC Family, calling on families to send in videos showing what they do during a typical family dinner, was at the center of the program. The three finalists aired during a movie marathon on ABC Family, and viewers got to vote for their favorite video. Several Grand Prize trips to Disneyland for family reunions were awarded.